In scrap processing, we've got the magnetic attraction! 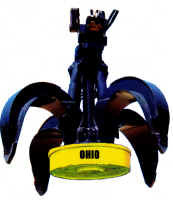 Ohio Magnetics offers stand-alone lifting magnets suitable for use with most grapple manufacturers' models. NOTE: Please specify your grapple manufacturer's size and model at time of order.